Fast Fourier Transform (FFT) is Discrete Fourier Transform (DFT) algorithm. To perform FFT in Python you need to install several packages/modules/libraries. You can skip this portion if you already have it available. I am a windows user so I will show how to setup your machine for windows environment. This is an effort to provide the easiest and extensive tutorial for image processing beginners in python. --> Open command prompt (cmd.exe) and type python to check whether python is installed or not, if it shows an unrecognized command then set your python directory (C:\Python27) as PATH environment variable. Ok, we are done with installation now. If you have any queries you may post it on the comment section below this post. All set? Great! Let's try out a simple application which reads an image and plots it. Here we are reading the image file 2.png with opencv's imread function. It is passed as a 2D-array to numpy's fft2 which is a 2D Fast Fourier Transform of the image which it receives as a signal. 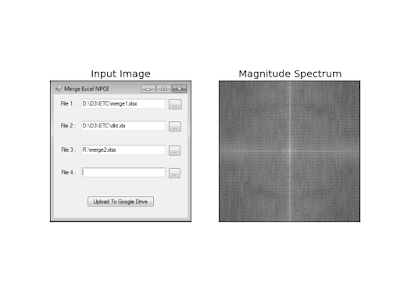 We are plotting the input image which is read as raw data in grayscale as fft reads is as grayscale just to visualize the effect. [Please correct me if I am wrong here] Along with that magnitude spectrum is plotted which is obtained through fast fourier transform of the given image.